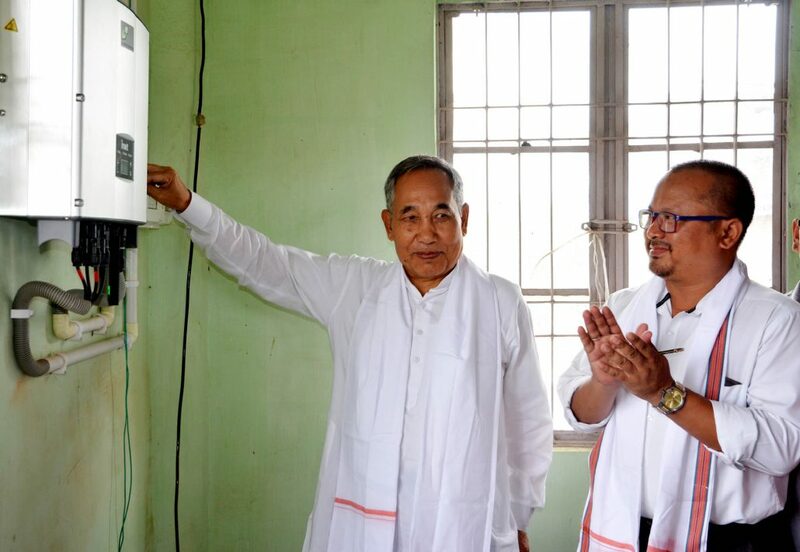 Manipur Deputy Chief Minister Yumnam Joykumar Singh said if the state is able to generate excess energy from the solar power it can be sold even to neighbouring countries like Myanmar. Joykumar shared this opinion while addressing the inaugural functions of Grid Connected Roof Top Solar power Plant of 5 KW each installed at Epathoukok Cultural Complex, Lamphelpat and Samadon Shanglen at Uripok NingthoukhongjamLeikai in Imphalon Wednesday. Stating that Manipur being under tropical climatic conditions where sunlight is adequately available throughout the year, he said there is a huge potential of solar power generation in the state and therefore a proposal will be made in this regard and will pursue to the 15th Finance Commission to allocate more funds. Informing that solar power generation is a renewable and useful concept rather than conventional power sources like thermal and nuclear which are non-renewable and hazardous to our environment, he said, being the cheapest and freely available power source, solar power generation can be developed in large scale in the state. The share of power which we are enjoying from Loktak Hydro Electric Project alone cannot meet the requirements we have and therefore Government has been spending more than Rs 400 crores annually in purchasing power from power grids.The only way out to meet the requirement would be to generate solar power in large scale, he felt. The day’s inauguration programmes were held as part of lighting up almost all areas under Uripok Assembly Constituency using solar energy. Seventy percent of the total cost of the Roof Top Solar power Plant meant for installation is borne by government while the remaining 30% has to be borne by the individual or the institution which have applied for the installation and Manipur renewable energy development agency (Manireda) is the implementing agency in the state. Deputy Chief Minister said, 45 sites, mostly public places like Community Halls, Club buildings and Cultural Complexes have been identified and 33 power plants have been installed and started generation and the remaining installations works will be completed latest by this week.Director, Manireda L Manglem Singh, also spoke on the importance of solar energy generation in the state. According to Manglem, 60-70 % of the total energy in the country have been generated from thermal power plants which causes a series of environmental threats. Therefore, to counter such challenges, people’s participation in spreading awareness on the importance of solar energy is necessary to sustain such projects.